We know you have choices when it comes to selecting a company to pave your driveway or grade and install a parking area, but did you know this…? The typical paving contract you’ll sign does not have the backing of the Consumer Protection Agency. Ours does. We have gone out of our way to have them review and put their stamp of approval on it. Because of that, you can rest assured that you’ll get no surprises. In fact, we invite you to download this sample 3-part consumer-protection approved contract that shows how you’ll get exactly what you pay for when you hire us. 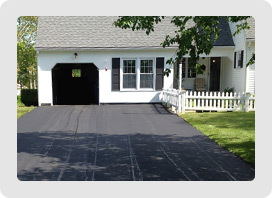 Simply put, our paving team is awesome at driveway installations, parking lot installations, and asphalt maintenance for residential and commercial paving projects in Southeastern, Connecticut (CT). 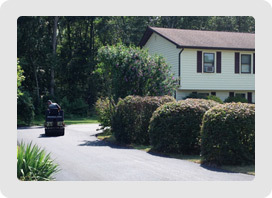 Let us help you to design a practical driveway or parking lot that is stable and long-lasting. A majority of our paving business comes from satisfied customers. In fact, you’ve probably noticed our signs everywhere. 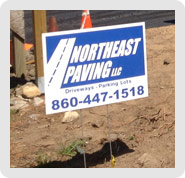 Based on over 30 years of experience with residential and commercial paving projects, Northeast Paving is the leader in driveway and parking lot paving and asphalt maintenance in Southeastern, CT.